As we get older, finding effective and low-risk ways to exercise can become much more challenging. The best pedal exerciser for elderly people provides a safe, low impact form of exercise which improves joint mobility, blood circulation, muscle tone and cardiovascular fitness, and can be done at home or at work. Sturdy and pre assembled product. Folds up easily for storing or moving. Good resistance level for elderly users. Product available in five colours. Low resistance suitable for elderly users. Sturdy product with handle for transportation. Good range of resistance and easy to adjust. Features magnetic mechanism and digital LCD display. High-tech product features multi-function display. Reverse pedal function targets different muscle groups. Magnetic resistance ensures smooth and quiet functioning. What Is a Pedal Exerciser for Elderly People? A pedal exerciser for elderly people is a device, usually lightweight and portable, which is made up of bike pedals on a stationary platform. It often features adjustable resistance which can be varied to change your exertion levels and build strength and fitness. A pedal exerciser for elderly people provides a low-impact form of cardiovascular exercise which can also strengthen your legs and arms. This form of exercise improves circulation, tones muscles, improves joint health and burns calories. Who Needs a Pedal Exerciser? A pedal exerciser can be beneficial for people of all ages, especially seniors. A pedal exerciser can be used for physical therapy and rehabilitation after an injury or operation, to strengthen weak or sedentary muscles, and to improve cardiovascular fitness and blood circulation throughout the body. It can also be useful if you’re returning to exercise after a lengthy break, as it’s both a low impact and low risk form of exercise which is safer for your musculoskeletal system. How do I Choose the Best Pedal Exerciser for Elderly People? It’s always best to first consult with a medical professional about which form of exercise is most suitable for your situation and needs, especially if you’re recovering from surgery or an injury. Pedal exercisers for elderly people have a variety of features for you to choose from. Many offer different tension or resistance levels, so you’re able to vary the intensity of your exercise and adjust this accordingly. Some models offer a battery powered display which shows various readings like time elapsed, distance travelled, calories burned and revolutions per minute, which is great if you’re wanting to keep track of your exercising. Many pedal exercisers for the elderly feature straps on the pedals for added security, rubber grips on the base of the product to prevent slipping, and some offer a strap which can be used to secure the product to the chair you’re sitting on. Some models fold up to make it easier for you to transport or store them, while others feature a handle to help make it easier for you to move them. 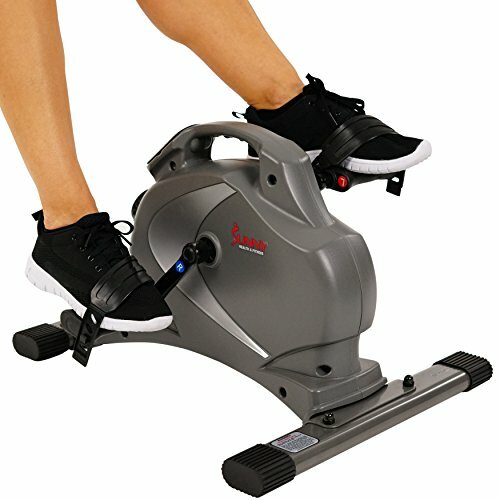 What Is the Best Way to Use a Pedal Exerciser? The best way to use a pedal exerciser is to sit on a chair or sofa, place the product in front of you and put your feet onto the pedals. 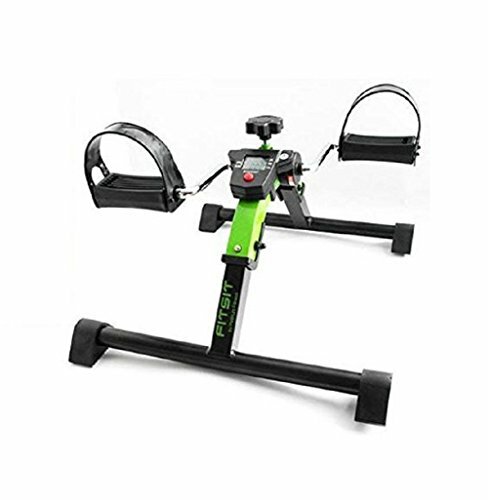 If the pedal exerciser has different resistance levels, select the one that best suits your needs and ability. Then you just need to start pedaling! Even at a low-resistance level, a pedal exerciser for elderly people will help to improve your mobility, strengthen your muscles and increase both heart rate and circulation. It’s also possible to place the pedal exerciser on a desk or table and use it to effectively exercise your arms. What Are the Features and Benefits of a Pedal Exerciser for Elderly People? As I previously mentioned, pedal exercisers have numerous features. Varying the resistance of the product allows you to build strength, improve your cardiovascular fitness, change the intensity of your exercise, and build your way up to more challenging tasks. Some pedal exercisers feature LED displays, which allow you to keep track of distance covered and time taken, as well as revolutions per minute and calories burned. Built-in straps to keep your hands and feet safely on the pedals, rubber non slip grips on the feet of the product, and straps to attach the product to the chair you’re sitting on all help to ensure a safe, secure and low risk method of exercising. There are numerous benefits of low-impact cardiovascular exercise from using a pedal exerciser. Research has shown that regular low-impact, moderate-intensity exercise in older adults improves aerobic fitness and leg strength, as well as energy and enthusiasm levels. It’s been discovered that exercise for elderly people, even at a low intensity, can help with weight loss, improve overall general health, reduce the risk of diseases like breast and colon cancer, osteoarthritis and heart disease, and increase longevity. What Is the Best Pedal Exerciser for Elderly People? With so many different products to choose from, finding the best pedal exerciser for elderly people can be a difficult task. We’ve done all of the hard work for you by selecting five of the most popular models currently available, and evaluating each of them on features, quality and value for money. This pedal exerciser for elderly people comes pre-assembled and ready to use. It provides a low-impact form of exercise which can be used as physical therapy for various issues. It helps to tone muscles, burn calories and improve blood circulation. The resistance level is easy to adjust with the tension screw feature, so you can increase or decrease the intensity to suit your personal needs and ability level, and work your way up to more difficult tasks. This product features a durable metal frame, and is portable, lightweight and sturdy. It conveniently folds up to allow for easy transportation and storage, and can be used in the home, under a desk, or even while traveling. The integrated straps on the pedals mean this product can be used to exercise both arms and legs, and the anti-slip rubber pads protect floors and surfaces while providing extra stability and security. Folds up for easy storage and transportation. Resistance level might be too low for some users. Hard to fit under standard desk. This pedal exerciser for elderly is fully assembled and ready for use, it measures 16 inches x 20 inches x 14 inches and weighs 4.4 pounds. It can be used during physical therapy as a form of low-impact, gentle exercise, which helps to tone muscles and improve circulation. This product can be used to exercise both the arms and the legs, and the tension strength can be adjusted depending on your requirements. 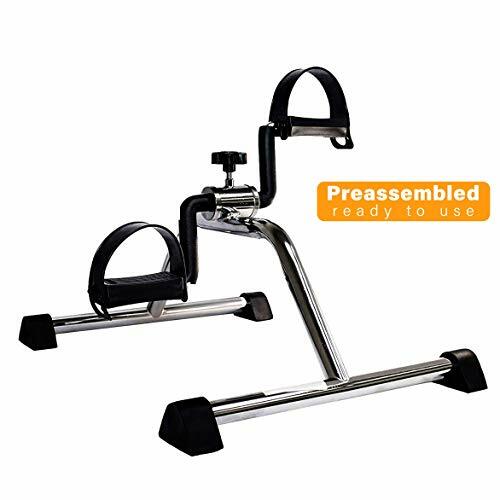 This pedal exerciser features a triple-layered, chrome-plated, heavy duty steel frame, which ensures no rust, full stability and lifetime durability. The sturdy frame sits firmly on the ground while in use, and is more stable than multi-piece products which are joined by screws and often much wobblier. The non-slip rubber base and feet give you good traction and security on all surfaces. Very effective for knee injury rehabilitation. Can slide on some surfaces. Pedaling motion is sometimes jerky. This pedal exerciser for elderly features a five-function LCD display which provides you with accurate readings for exercise time, revolutions per minute, total revolution count and calories burned. The new Cool Rev technology stops the product from overheating, which can sometimes occur with these machines. 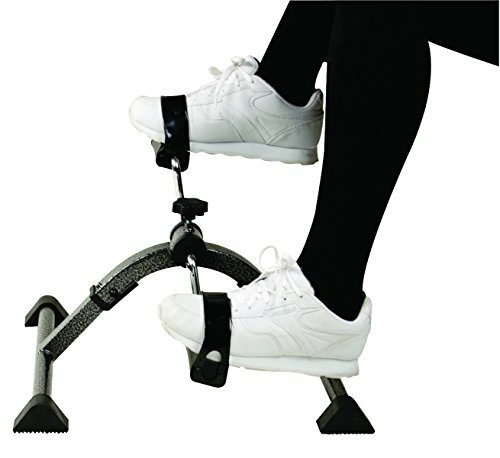 The integrated pedal straps mean this pedal exerciser can be used to work both the legs and arms. It’s available in a selection of five colours, and the folding frame is easy to store, travel with, and set up without any tools. The powder-coated frame is easy to clean, and the foot pads don’t leave marks. This product also includes a free anchor strap, which connects the pedaler to your chair directly and prevents it from moving and sliding while you exercise. Available in a selection of five colours. Folds up to small size. Metal parts heat up during use. Won’t fit under standard desk. Resistance can lower through regular use. Product unstable and can slide on surfaces. The Sunny Health and Fitness pedal exerciser for elderly measures 22 inches x 18 inches x 14 inches, and the durable design supports weights of up to 220 pounds. It features a digital LCD display, which makes it easy to track your progress with readings for time, speed, distance and calories burned. The reliable and quiet magnetic mechanism includes an eight-level micro tension controller which allows you to increase or decrease the resistance depending on your needs. The oversized and textured non-slip pedals are suitable for using with either feet or hands, and the small grooves and safety straps ensure a comfortable fit for all sizes. The grip on the base of this pedal exerciser ensures no movement while it’s in use, and the free heavy duty plastic strap can attach the product to your chair for extra stability. This pedal exerciser is portable and compact, allowing for easy storage in small spaces. It also features a handle which makes transportation easy. Smooth and comfortable pedal function. Can fit under a standard desk. Can slide around on wooden floors. Small pedal range to fit under desk. This pedal exerciser for elderly features a low pedal height of 10 inches, which means it can be used under furniture as low as 27 inches. It weighs 23 pounds and the pedal arm length is 3.5 inches. It features eight calibrated resistance settings, which offer more than twice the range of many similar products. Magnetic resistance and an effective flywheel weight means the pedals move smoothly and quietly, unlike noisy friction resistance often found in other models. The multi-function display shows speed, time, distance and calories burned, and the online calorie calculator found on the company website gives a very accurate reading. The low height of the product and wide base helps to prevent it from rocking back and forth, and the large pedals include adjustable Velcro straps. This product features bidirectional pedal motion, so it’s possible to pedal in reverse as well as forwards, allowing you to work opposite muscle groups. Using this product at the lowest setting feels like you’re doing very little, however it will up your energy expenditure by 50 percent and increases oxygen flow to your brain. Low-level cardiovascular exercise helps to burn calories, and can improve joint health, mood and overall general health. Calorie setting resets to 0 after 1000. Calorie count can be inconsistent. Weak strap for attaching to chair. After evaluating five of the best pedal exercisers for elderly, our preferred choice is the BodyHealt Pre-Assembled Fold Up Leg Exerciser. It’s lightweight but also sturdy, comes pre-assembled and ready to use, and functions quietly. The rubber grips on the base of the pedal exerciser effectively prevent it from moving around, which was an issue with both the Vaunn and Platinum Fitness exercisers. Both of these products also had manufacturing issues which negatively affected their overall quality such as squeaking, overheating parts and jerky movement of the pedals. 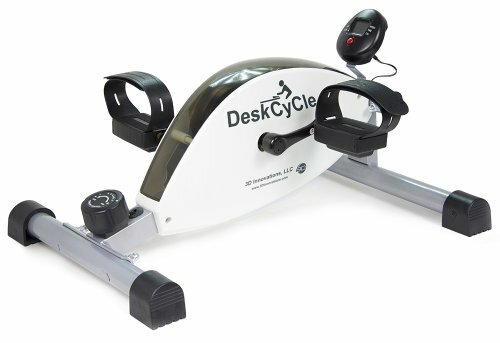 Both the Sunny Health and Fitness and the DeskCycle exercisers had features which weren’t particularly necessary or useful for elderly users, such as the LED displays and high resistance levels. These products were also considerably heavier for elderly people to move around, the designs were less portable, and they were a lot more expensive than the simpler models. The combination of effectiveness, value for money, portability and the most useful features for elderly users makes the BodyHealt Pre-Assembled Fold Up Leg Exerciser our choice for the best pedal exerciser for elderly people currently available. What is the Best Upright Exercise Bike in 2019? What Are The Best Recumbent Exercise Bikes in 2019?